Function follows Design? The Toshiba Satellite U300-114 is a classical subnotebook with 13,3" display and good looking design. A Core 2 Duo T5450, 2GB main memory and a 160GB hard disk provide sufficient power for office and Internet. However, games should not be tried with the integrated video card. The following review uncovers whether this Toshiba notebook is a good companion or whether it only looks good with its glossy display cover and LCD. 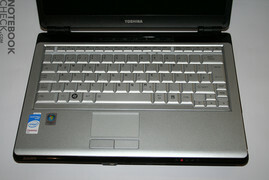 The Toshiba Satellite U300 looks good by its decent design and its silver top side. Also the hinges look good and seem to be sufficiently stable. When the notebook is open, there is a gap between case and display. Combined with a shiny blue Satellite logo down left, the U300 looks modern and of high-quality. However, we doubt that the shiny black surfaces will still look that good after months of intensive use. Unfortunately they are very sensible. Still, the surfaces look more stable and of higher value than those of some competitor notebooks. Only the pressure resistance could be better. Furthermore, the hinges creak when moved. The Toshiba's keyboard is average. The layout is classic, only the left shift key is alike the cursor keys a little smaller. Furthermore, the keys are labeled in English, which could be cumbersome for some. The travel is short and the point of pressure good. Unfortunately the whole keyboard area is sensible to pressure. The keyboard yields by a whole centimeter. The Satellite's touch pad works precisely and accurate. Reasonable hot keys are well placed above the keyboard. Furthermore, there is a volume control available at the left side. Whilst the pressure resistance should be generally improved, especially of the keyboard, the palm rest areas and the area which surrounds the hot keys is very stable and pressure resistant. The Toshiba Satellite U300's 13,3" display has a maximum resolution of 1280x800 pixels in format 16:10. The maximum brightness of 218,1 cd/m² is generally good, but, the brightness diminishes top down in a way that is visible to the naked eye with unicolored backgrounds. Also the black value of 0.8 is a little bit high. The maximum contrast of 273:1 is average. But, we liked the horizontal viewing angles. 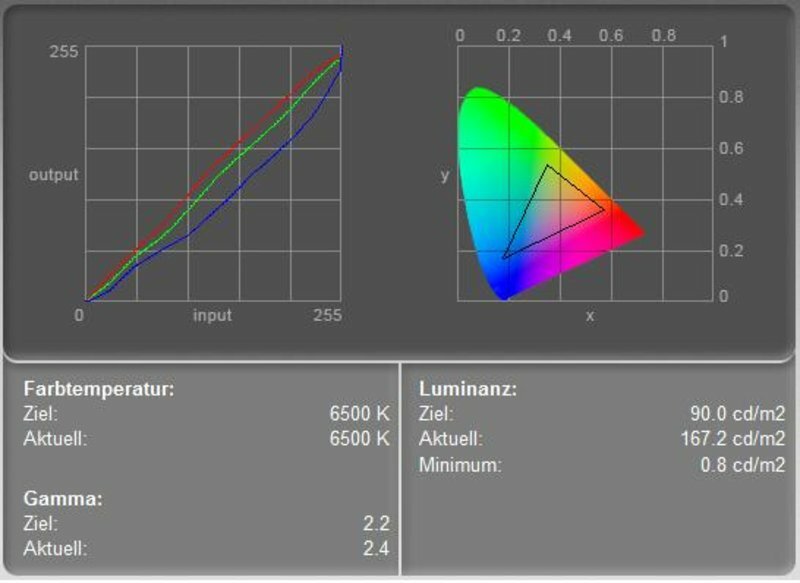 Only at acute angles the colors change and the picture gets blurred. Vertically, the picture changes quickly, especially when looking from bottom up. A special feature is the menu, which is displayed from top down, when one strikes the Fn keys. It stands out against the simple green bars or baroque pop-ups by other competitors. The gray, sharp menu opens in a fluently animated way and fits well to the impression of reasonable design the U300 generally left. Unfortunately also Toshiba follows the trend to equip more and more notebooks with reflecting display. The Satellite U300 is no exception. It makes working outdoors impossible, even if the display might be otherwise sufficiently bright. The speed of reaction and the stability to the vantage point are subjectively good. In total the diminishing brightness and a slightly high black value devalues the rating of the built-in LCD. While the office performance is, because of 2GB main memory, good and all standard Windows applications run quickly without problems, it was clear from the start that the U300 won't allow playing games with high 3D demands. It is designed as mobile office and multimedia notebook and not for 3D applications and games. In idle mode the noise level is about 32,7dB, which is alright. Also under load the Toshiba Satellite U300 stays quiet and a noise level of 36dB is never exceeded. The noise level of 35,4dB at DVD playback is also low. The heat emissions of this Toshiba notebook are absolutely alright. Especially the surface temperature of the palm rest areas reaches comfortable 32 Grad in average, and gets never uncomfortably hot. Also the other surfaces reach only a maximum of 37.8°C, which is alright too. At the bottom side we measured a maximum of 43,1°C. Furthermore, the main fan is at the left side of the notebook, so, its warm waste heat does not disturb the mouse hand of right handers. However, left hander should take care. 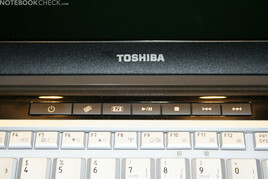 The Toshiba Satellite U300's speakers are left and right above the keyboard. There sound is rather average. The basses could be better and the high tones are a little tiny. The maximum volume is sufficient for watching DVDs, if you do not mind the quality of the sound. In order to enjoy music, we recommend using a headset or external speakers. The battery runtime of this Toshiba notebook is rather short. 90 minutes are unfortunately too short for enjoying DVDs unplugged. The maximum runtime of 300 minutes is reached with dimmed brightness and deactivated WLAN. The Toshiba Satellite U300 is a good looking, solid 13,3" notebook of good workmanship. Unfortunately the glossy surfaces and the glossy display have also disadvantages which are in our opinion not set into perspective by the pros. If you do not mind playing games or working outdoors, the U300 is a nice notebook with some smaller weaknesses. One of the main pros of the Satellite U300 is its good price/performance ratio, which is one of the most important criteria in the fierce competed subnotebook class. Even closed the Toshiba Satellite looks good. But also after opening it, everything seems so slick and smooth. Especially the silver surface attracts attention. And also details like the blue shiny logo look good. The hinges seem modern and of high-quality. The workmanship is not so good, but the hot keys are reasonably located. The surface temperature never exceeded 43°C. All 13"-14" notebooks including Apple's Macbook and Sony's Vaio VGN-C1 must match with the U300. The competition among subnotebooks is fierce.